Tank the Blue and Gold Macaw became widely known on Facebook by people all over the world after he was donated due to severe neurological problems. He had been on the bottom of his cage for several days, unable to eat or drink, and was emaciated (skeletal) when he came to us, with his head twisted sideways and his life in danger. We spent two weeks, and what would have been (at full price) thousands of dollars in testing and treatments, trying to diagnose his problem and help him recover. He had to be wrapped in a towel, strapped into a hammock, or propped up to keep his head upright. Although he initially improved, despite all of our efforts he eventually got worse and had to be put peacefully to sleep. The pathologist discovered that he had the first case ever reported of a raccoon roundworm larva in his brain that was obtained by chewing on sticks picked up outside. Every other published case had known exposure to raccoon droppings. His sad case will help other veterinarians learn about the danger of using perches made from untreated branches found outside, and what measures must be taken to kill these worm eggs, so he may save the lives of other birds. 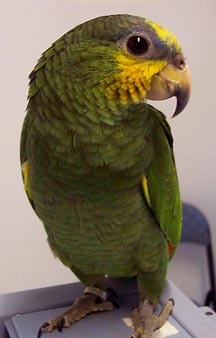 Penny the Quaker Parrot had an injury to her lower beak, causing it to be split into two sections, with one side that constantly overgrows. She had visited our veterinary hospital twice over the last 3 years with her severely overgrown beak poking into her eye socket (as shown) or into the side of her face. When she came in with wounds like this for a third time, we could no longer tolerate sending her home to suffer this fate again. We called animal control, who threatened to confiscate the bird and press charges if she wasn't surrendered. Penny now lives with a family who brings her in on a regular schedule to stay trimmed and healthy, and will no longer suffer in pain when her beak pokes a wound into her face or eye socket. Don't worry, Nickie Lee is very much alive, but in this photo she was still sleeping after undergoing surgery. During her intake exam when she was donated to Burge Bird Rescue, we noticed her crop was especially full and solid. After withholding her food overnight, it still felt the same. It turned out she had been swallowing fibers from a toy or rope perch, and they had formed a ball in her crop. 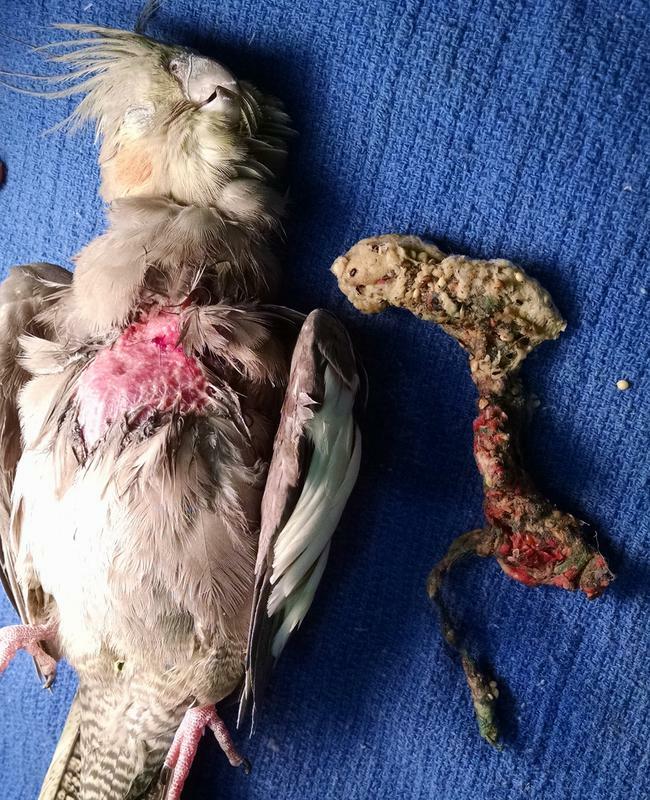 In her case, which is one of the worst we have ever seen in a bird that was still alive, the fibers went all the way into her stomach. It was amazing that she wasn't vomiting, very skinny, or dead. Once this massive "fiberball" was removed she made a rapid recovery, and has moved on to a new home, where she will never be allowed to chew on any kind of fabric! It is rare for a bird to actually swallow these fibers, so it is safe for the vast majority of them to have rope perches and toys. 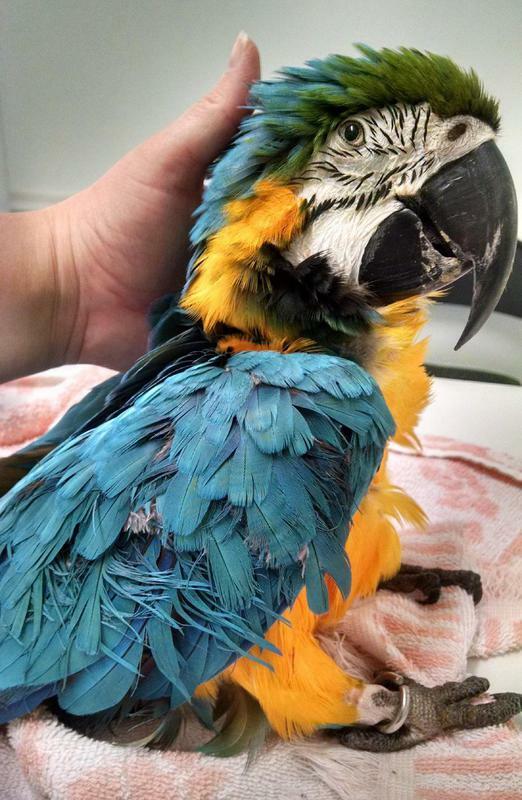 Sam the Blue and Gold Macaw had a lump growing on his leg for 5 years! Two previous owners had been told it was nothing to worry about by another vet. 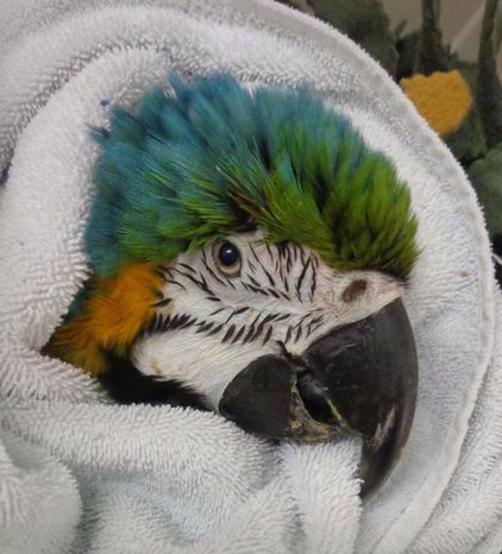 The third owner only had him two weeks before he decided the bird needed veterinary care that he couldn't afford. Sam's intake blood work showed that he was very anemic, and his physical exam revealed that he was extremely thin. It was possible that the giant lump that was making it difficult for him to get around was also causing him to be skinny and sick. We took him to surgery, got it off with no problem, and within a week his blood count was going up and he was gaining weight. The tumor weighed 138 grams, over 1/2 pound, while he weighed 900 grams before surgery. It was the largest tumor I have ever removed from a bird! The pathologist determined that the tumor was a hemangiolipoma, a very rare growth that was a combination of a blood vessel tumor and a fatty tumor. It was sucking up so much of his blood and calories that it was going to kill him even though it was not an aggressive type of cancer. Following his surgery his blood count has gone back to normal, and he has gained weight. There is no sign of the tumor growing back. We are still trying to find just the right home for Sam. Don't worry, this is another bird that is asleep following surgery. How many birds do you know that have been rescued by a cat? What else would you name this little parakeet? We decided on Kitty. When a nice lady let her cat in after he had been outside for a stroll, he brought in this little bird that he found in the yard. Apparently she was turned loose by someone who didn't want her any more, because she was never reclaimed. Cat germs are extremely dangerous and rapidly fatal for a bird, so of course she was started on antibiotics immediately. She had a small wound over her knee that had to be stitched up, but she made a quick recovery and was adopted. Most of the time when we get a duck in our rescue program it was one we captured after it was abandoned in a pond. In this case, the owners had purchased two ducks for their kids, but didn't set up a safe place for them to live, and they knew nothing about proper care. One was killed by some kind of animal, and this one was later attacked and her legs were paralyzed after a neighbor's dog damaged her spine. They were not willing to take her home to see if they could nurse her back to health, and they stopped returning our calls and refused to pay for her hospitalization, antibiotics and daily therapy. 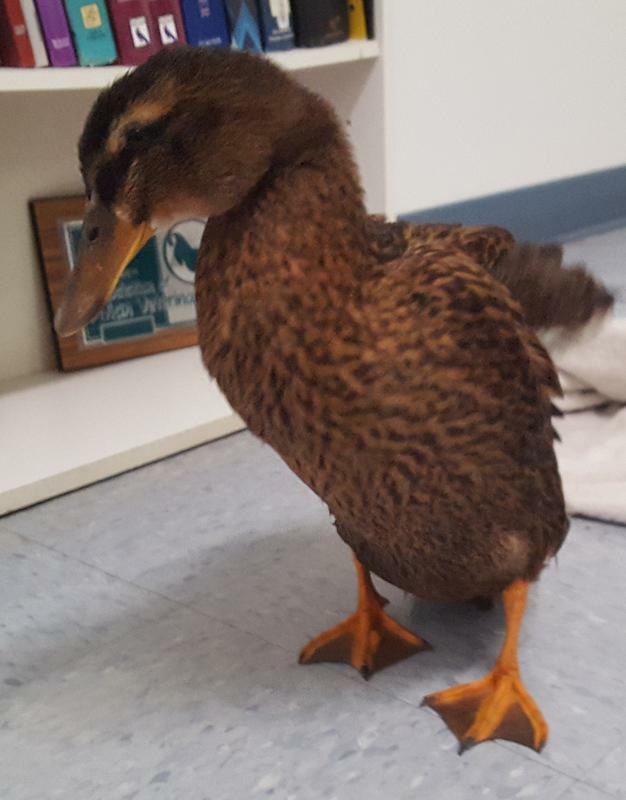 After several weeks in our hospital with her own indoor swimming pool for therapy, this sweet girl was finally able to walk again, and was adopted by someone who had a safe home for her with other ducks to be her friends. Fiona the parakeet (budgie) came to us with a huge swollen belly that was starting to drag on the perch and get sores. We determined that she had a hernia, and scheduled surgery to repair it. When we opened her up, it turned out her uterus was very enlarged and had to be removed, so we did a hysterectomy. The surgery took long enough that we decided to hold off on repairing the hernia until she recovered from the first operation. She has now developed a strange thing we have never seen before. Her longest tail feather has grown to more than twice the normal length of a budgie tail! We have no idea why this happened unless it was starting to grow at the time of her first surgery, and the stress caused some sort of reaction where it made the feather keep growing. We wonder how long it will get! Every year someone calls to say they need a home for 20 or more little birds that they allowed to breed and breed and breed. Well, every year except this year. In 2017 when the call came it was "only" 19 budgies that they needed to leave with us after the owner developed cancer. We do our best to make room for as many birds as possible, but it gets difficult when we get that many at one time. Please, if you aren't planning to keep all of the offspring for the next 15 or more years, or you don't have homes lined up for them, don't let your birds breed. No, we don't routinely spay and neuter them, but at least do not provide them with a nest, and separate the males from the females. There is no excuse for letting your dogs, cats, rabbits, horses, or any other pet reproduce unless there are good loving homes waiting for them. There are millions of animals every year that need to be adopted. 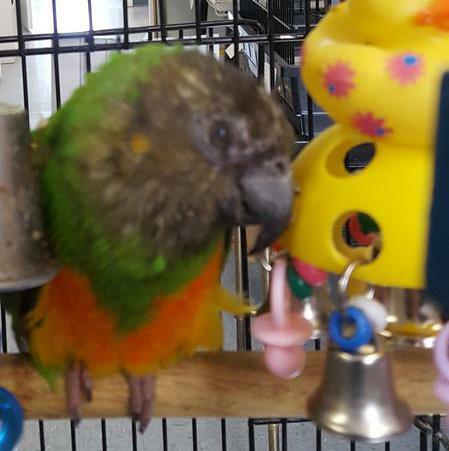 Billie the Senegal Parrot was one of our very special needs birds. We will take some of the birds that other rescues might consider unadoptable. We don't know exactly how old she is, but she was completely blind from cataracts. A blind bird can live full, happy lives if you keep everything in the cage in the same place, and always talk to the bird so he isn't startled by you sneaking up silently. There is a perfect home for every bird, and after a couple of months with us Billie found hers. We don't know how long she has left, but we know her final years will be happy ones. When an accident happened to a sweet little cockatiel, only two months old, she was left with a broken tibia (shin bone) with the end of the bone poking out thru the skin. It is very difficult to save the leg when a bird has an open fracture like this, and many times it has to be amputated due to infection. We managed to save her leg, but the bone would never heal. She now has to wear a boot type bandage that must be replaced every two to three weeks. Her owner was having a hard time driving to our office that frequently, so she came to us and was adopted by the sweetest family of a mom and her 3 adorable daughters. Little Peggy the cockatiel could not have found a better home!